Back again with another "Impression Obsession meets Shimmerz" card...but first...the winner of last week's stamp giveaway is.......... Sandra! I would like a chance to win! I do love the colors you use, and the gems just make the card!Thanks for the inspiration! 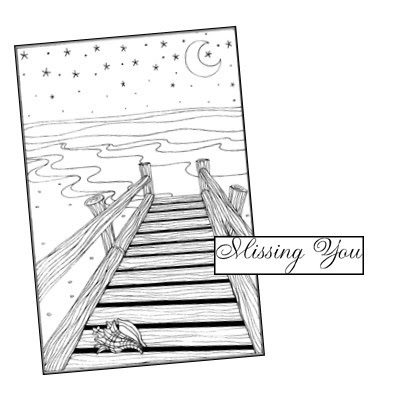 This week's drawing is for the stamps used below - Night Pier and Missing You. Leave a comment on this post for a chance to win! I'll post the winner's name at this same time next week (Wednesday midnight EST). I used a waterbrush to paint the mixtures onto the image, and added some shading with watercolor pencils. Highlights were added with a white gel pen. One other detail - on the sand, while the paint was still wet, I pulled out my brown blow-pen and added a little spatter. The wet paint allowed the ink to bleed just a little - love that, though it's a little hard to see in the photo. You can see a bit of the sparkle in this closeup: Be sure to visit the I.O. Blog for links to creations by the other team members, and stop by the Shimmerz blog as well! Thanks for stopping by! Dina, for me, you are the costliest blogger out there. I see something you make and I feel compelled to get the stamp. This is no exception! WOW Dini! BRILLIANT artwork! Absolutely brilliant! Oh MY! What a beautiful card! I have been coveting this stamp, but just wasn't sure how it would look on a card, and I think you have sold me. What a beautiful card! Amazing colorind. Gorgeous job. Lovely stamp from IO. So beautiful! It makes me think of the island of Saipan. A mission trip to minister to the children and community. The children will forever be in my heart. I do miss them so much. Wow this card is fabulous and that stamp set is so peaceful and would be another great manly man set. Thanks for a chance. This is a really cool stamp and your card is beautiful. This really is so pretty, Dina! Like I said, this is really like an evening on the pier. Mine....not so much! Incredibly beautiful. Your coloring skills are magnificent. Love this stamp and your card. I would love this stamp. your card is gorgeous, Dina. I didn't know that Shimmerz could be mixed with ink. I learn so much from you. I also like your idea of the spatter on the sand. Thanks for another chance to win yummy blog candy. Such a serene setting! This card could be used for so many occasions. So beautifully done. The Shimmerz adds the perfect touch! Thanks for a chance to win this gorgeous stamp. This card is beautiful! thanks for a chance to win! Wow what a beautifully colored creation!!!!! Beautiful IO stamp & your coloring is stunning! Thanks for sharing information on your media & coloring process! These images are really fantastic. I love what you did with them. Gorgeous card, Dina! I love the Shimmerz you used to make it sparkle! love the card Dina! really pretty. Love the stamp of the pier. Makes me think of going to the beach. I would love to win your prize. Oh my gosh this is awesome...Love it!!! Such a beautiful colored project, just stunning!!! Lovely makes me feel like I am at the beach. Love your coloring - I can see that this would be a fun one to color!